LibDem Candidate for Banff & Buchan, Galen Milne, with his General Election campaign team. Galen Milne has been formally adopted as the Scottish Liberal Democrat candidate for Banff and Buchan. Galen was the local Lib Dem candidate in the 2010 general election and is delighted to resume his challenge in the forthcoming General Election. 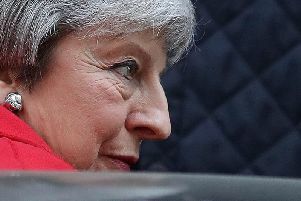 Commenting upon his adoption, Galen said: “The Tory Prime Minister has called this unnecessary snap general election as she seeks to silence the growing unrest over Brexit while the Labour Party is in disarray. "However none of us should forget it is a General Election and not a single issue campaign. "The Scottish Liberal Democrats are both pro UK and pro EU. We want to retain both, and remain part of the single market as we believe it brings jobs to Banff & Buchan. We will continue to lobby for citizens to have an opportunity to consider the terms of our exit once they have been finalised and are visible for all to see. "Here in Scotland we have had ten years of an SNP government that has recently let down our farmers badly. Many of the crucial EU payments are long overdue and it is unfair for the industry to bear the brunt of the costs of bank loans etc because of ineptitude and the failure of good governance. "Our farmers and our entire interdependent rural economy deserve much better treatment from the Scottish Government than this. "Liberal Democrats accept there are both justified criticisms and concern about the CFP. It has failed to deliver because it is remote, centralised and bureaucratic. However I believe the lack of access to the single market poses a bigger threat to all in the fishing industry for our exports. "Fishing rights in the past have been traded away by the Tories as if they were bargaining chips. (but we will fight protect the industry against another sell-out in the event of a hard Brexit). With this in mind local Lib Dem Peer Lord Malcolm Bruce of Bennachie tabled an amendment to the Brexit Bill going through the House of Lords in March to ensure no commitment is given by the UK government that could adversely affect fishing rights within UK territorial waters without the Government first obtaining the consent of the Scottish Parliament, Welsh Parliament and Northern Ireland Assembly. "My other main campaign priorities will be the improvement of job prospects for local people faced with the downturn in the oil and gas sector. I will lobby hard for better broadband services to enable our small businesses to thrive and prosper. In coalition the Liberal Democrats delivered the triple lock on pensions, something the Tories are now trying to dismantle. "We have continually raised awareness about mental health services and successfully campaigned in government to educate everyone about the need to care and share when times are hard. "I want to put the politics of division behind us and focus on making Scotland better. Banff and Buchan is an attractive environment in which to live and work. Better representation can deliver enterprise and jobs while ensuring our towns and villages keep their individual identities”.